Lake Worth contains a bounty of public parks and open space. The Municipal Beach is one of the last remaining large tracts of open, public space on the ocean in southeast Florida. The City Pier, jutting into the Atlantic, is a recognizable symbol of the city; much of it was destroyed by Hurricane Frances in 2004, but has since been rebuilt and raised 5 feet (1.5 m). In 2012, the Snook Islands Recreation Boardwalk and Fishing Pier is scheduled for completion, where county residents will have access to Lake Worth and the Intracoastal Waterway for fishing and nature walks to view the mangroves and manatees. Between the main cities of West Palm Beach and Fort Lauderdale are three smaller coastal communities, and each claim a surfing centerpiece that can be accessed off A1A. 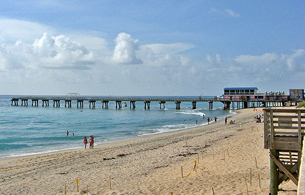 Lake Worth, which divides Palm Beach and South Palm Beach, has a pier of questionable reputation. When the sandbars are established, this pier provides the most consistent surf in South Florida, but the break is more famous for serving up steady beatings. Even if you don't get punched, you probably won't snag any good peaks, either. At least getting to the Lake Worth Pier is easy. It's inside Lake Worth Municipal Beach off A1A, with plenty of metered parking. Clearly, Lake Worth must house a good wave to justify such extreme measures; in fact, it offers several. First, just before the guarded area on the south side of the pier, a sandbar runs farther south in front of an old seawall called Blackwall. When north or northeast swells are running and the sand is settled, fast, hollow waves reel along this bar, earning it the hyperbolic name, Banzai. The Pier's south side maintains an outside sandbar as well. Overhead swells will break off the end of the pier, mush out and then reform down by Blackwall. On the biggest swells, it gets steep and fast and occasionally connects all the way through to the inside. The south side is one of the better spots during nor'easter conditions -- if there isn't too much underlying groundswell -- as the waves are shielded somewhat from the wind. While north swells will often bypass Palm Beach and be bigger in Lake Worth, the pier gets juiciest during east/southeast wind swells. Sandbars off Blackwall will throw good rights under these conditions. However, if North side is working, it's arguably the best peak on either side of the pilings, throwing hollow, high-speed, top-to-bottom rights.